aData of 45 successful cases. aResults of nine cases only. Abbreviations: RPPL, retroperitoneoscopic pyelolithotomy; PCNL, percutaneous nephrolithotripsy. 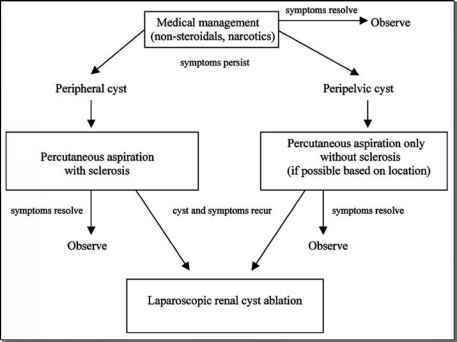 perirenal adhesions, making dissection difficult. Mean operating time was 142 minutes versus 72 minutes for percutaneous nephrolithotripsy (p < 0.0001). Blood loss was similar 173 cc versus 141 cc. Mean hospital stay was 3.8 days versus 3 days, although the duration of convalescence was somewhat shorter in the percutaneous nephrolithotripsy group. Laparoscopic pyelolithotomy is associated with longer operating time, longer recuperation, is more invasive, less cosmetic, and requires more skill as compared to percutaneous nephrolithotripsy. Advanced endourological facilities are required for removal of calyceal stones in the event of migration or for localization of stone such as laparoscopic ultrasound. Laparoscopy is not suitable in patients with dense peripelvic adhesions or history of previous retroperitoneal surgery. indicated for ectopically located, dure is indicated such as pyeloplasty (30-33). Acceptance of any surgical procedure depends to a large extent on the demonstration of technical efficacy and an acceptably low complication rate. However, apart from the initial cases where open conversion was required, this has not been a problem in subsequent cases. Among the major intraoperative complications, rare vascular and visceral injuries have occurred, albeit managed successfully. Among 247 cases of retroperitoneoscopic surgery for calculous disease, comprised of ureterolithotomy (n = 85), pyelolithotomy (n = 27), nephrectomy (n = 114), and nephroureterectomy (n = 31), we had 10.9% minor complications, 1.6% major complications, and 6.8% conversion to open surgery (Table 7). Unforeseen hemorrhage can occur at any time during the procedure but this does not make it any different from open surgery for calculous disease. Possible problems and tips to manage these are described in Table 8.
aNumber of cases is given in parentheses. Abbreviations: USG, Ultrasonography, ESWL, extracorporeal shock wave lithotripsy.